It’s just that simple. We now live in a time where marketing no longer reaches out by annoyance but by content filled with rich stories, SEO, automation, analytics, and so many other intuitive methods. Generally anything besides making those awkward phone calls in hopes of securing a customer. That’s the beauty of Inbound Marketing. The barriers have been taken down. The opportunity for creativity and passion to be instilled in the way we choose to represent our brand is endless. 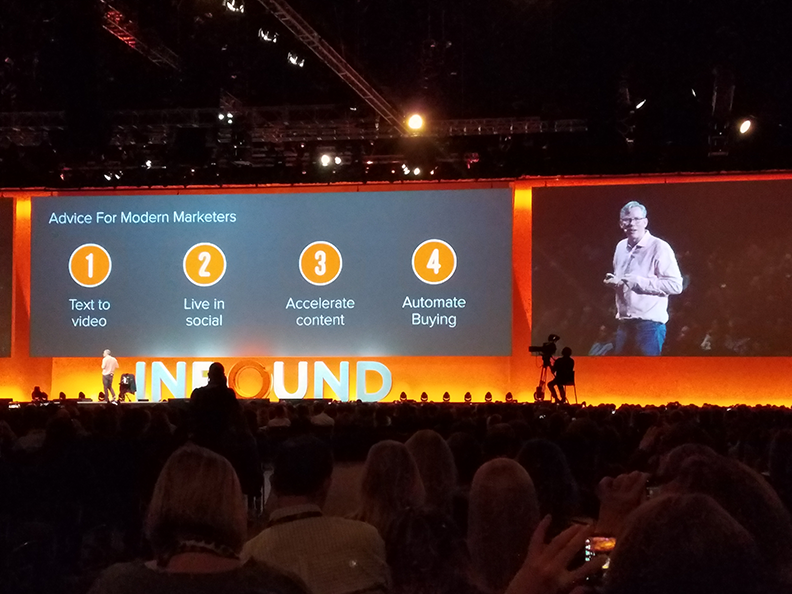 Inbound brings forth a new frontier where captivating attention–and day trading it–becomes the holy grail of our marketing efforts. 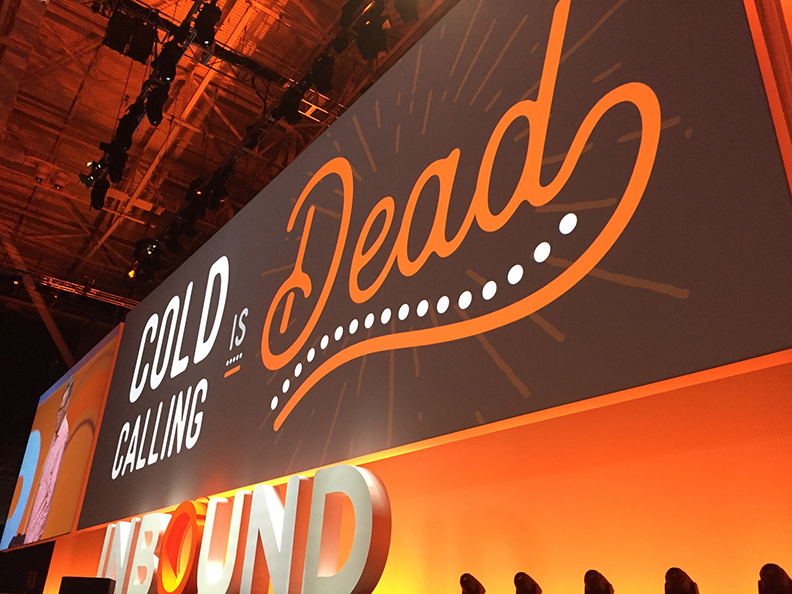 INBOUND16 brought together over 18,000 attendees who live and breathe in the world of marketing, sales, and CEO-land, as well as HubSpot customers and agencies who understand the mentality and passion behind inbound and organic reach. All of us scurrying from session to session, taking notes and absorbing as many thoughts and tactical tips as possible to bring back to our organizations. A few INBOUNDers from our marketing department flew to Boston to be a part of the gathering and came back full of insight. Upon landing, these three scattered throughout the convention center to gain the best marketing knowledge in the industry. In the three and a half days of attendance Cherie, Cody, and Mark witnessed powerful keynote presentations from marketing gurus such as Gary Vaynerchuck, the “eloquently” spoken founder of VaynerMedia and host of #AskGaryVee, as well as Brian Halligan and Dharmesh Shah, Founders of HubSpot. Celebrities filled the halls of INBOUND as well. Stories of the rise and grind were told by Anna Kendrick, Michael Strahan, and Serena Williams. Even Alec Baldwin graced INBOUND16 with his presence one morning! The passionate life-tales and insight didn’t end there. Hundreds of breakout sessions filled all 80 rooms of the Boston Convention center as well as both of their grand ballrooms. To summarize INBOUND completely is almost impossible. To experience this wealth of powerful knowledge and standout mentors, as well as those sharing the field of inbound from around the globe together in one location is something you truly have to be there for. 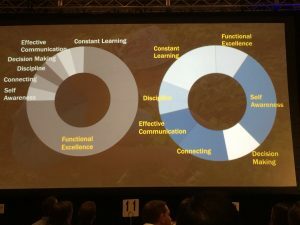 To squeeze just a little bit of this experience out of the conference we asked our three in-house-INBOUND-incumbents what moments of enlightenment, insight, actionable tips, and fun they experienced individually. 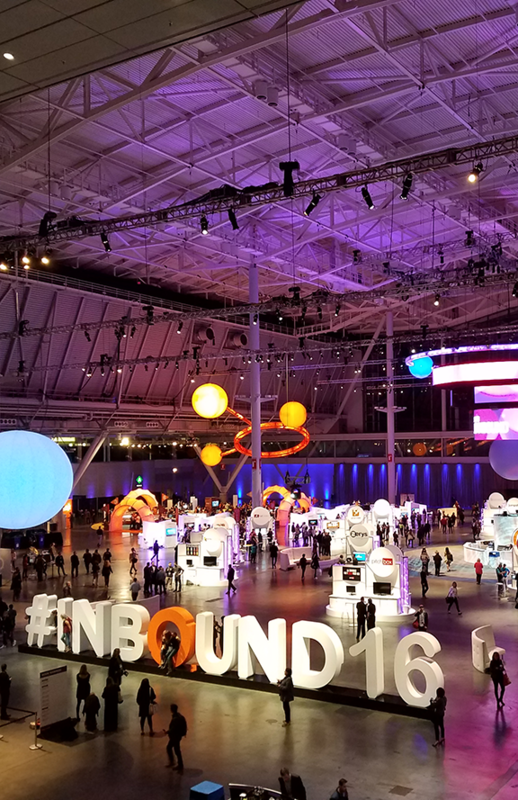 Cherie – PR & Social Media Specialist, ABG Capital: “INBOUND16 was such an incredible experience that it’s difficult for me to pick just one takeaway as my favorite. 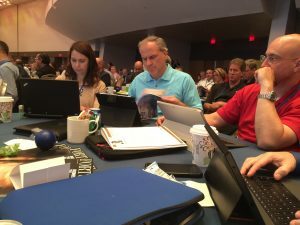 The initial thought I have anytime I reflect on INBOUND(16) is how amazing it was to be among other people in my field who just “get it.” The fellow attendees understand how crucial it is for us marketers to do what we do for a business. They also understand that while we have the “fun” jobs of the company, what we do takes hard work, strategic planning, analyzation, concentration, and creativity. Mark – Product Manager, InspiraFS: The Session titled: ‘The Science of Selling: How to Sell the Way our Brains are Wired to be Influenced and Form Buying Decisions’ really stood out for me. David Hoffeld, The Hoffeld Group stated “63% of the behaviors salespeople deploy decrease the likelihood of a sale.” SAD! As marketers, we should care deeply about how prospects’ brains react to sales strategies. At the end of the day we are trying to drive sales, just in a different environment. There’s no reason we shouldn’t incorporate the science of selling into our content. Cody – Inbound Marketing Specialist, ABG Capital: INBOUND showed me that your story matters. Something that outbound, or “interruption marketing,” doesn’t necessarily embrace. Interruption marketing is simply the interruption of someone’s activity to grasp his attention…it’s an annoyance. We’ve all seen in it with spam, pop-ups, ugly banner ads, cold calling, and even TV. 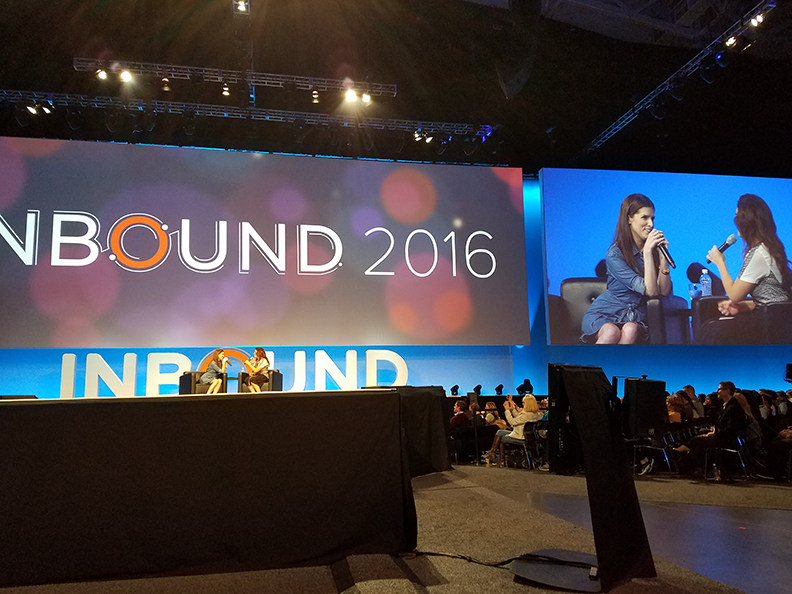 #INBOUND16 showed me that your story matters. In Gary Vaynerchuck’s keynote he explained that the television networks we know and love are becoming extinct. What’s replacing them? Intuitive social media platforms that tell stories. Our iPhones have become the basis of our entertainment. They’re our new television sets. They’re filled with the networks we know and love–Facebook, Twitter, SnapChat, Instagram. We follow brands and celebrities by choice. Not by interruption. We “tune-in” to their stories, latch onto their content, and implement their output into our daily lives. Not because we were caged into watching a 30 second spot in the middle of the Walking Dead because our On-Demand isn’t working–but because we as a society, we as a human race, place emotional ties into what we view and love–the quality of story-telling. As I said earlier, summing up the lessons learned from INBOUND in their entirety is nearly impossible. However, we can give you few actionable tips that can improve your website and your conversions today! Remove your slider/carousel hero banner. These diminish CTR (Click Through Rate) and take away from your value proposition. A value proposition–you should have one! Peep Laja with ConversionXL has one of the best articles on how to create a great value proposition. Read it and test yours starting today. If you find this hard, just pretend someone asked you what you do and how you’re different. Once you’ve compiled that, organize it into a value prop and get it up on your site. Define your conversion funnel assumptions. When someone lands on your homepage, where would he or she logically go next? Make that next step easier. That’s conversion optimization in a nutshell, and you can try that for each page. Use any data you have, or start with assumptions and test, test, and test some more. Optimize your blog. Aside from your homepage, your blog is probably the second highest visited part of your website. You’d be surprised how your blog is leaking opportunities to convert. Testing…Testing…Testing! So how can you do that? Add Hotjar to your site today. This will show you heatmaps, user recordings, and more. Start using these tips today! We’ll be sure to enlighten you with more after INBOUND17. Grab your tickets for next years INBOUND with your company; you never know, we might just happen to see you there! Staying current on the latest strategies for recruitment, execution, development, and operations is key. It’s a tool that ABG Capital uses to sharpen their current skill sets. It’s hard to argue that attending the Gazelles Growth Summit isn’t worth the time and travel. Especially when you’re recognized and awarded time and time again for growth, culture, and employee satisfaction. This year alone ABG Capital and its portfolio companies have reeled in eleven awards from Inc. 5000, Pittsburgh Business Times’ 100 Fastest Growing Companies, and Inc.’s 50 Best Places to work…just to name a few! As some of you may or may not know, ABG Capital attends the Gazelles Summit, presented by Fortune, twice a year. The spring Summit focuses on leadership and the fall Summit focuses on growth. There, top news-makers and thought-leaders along with hundreds of executive teams from participating companies are gathered for two intense days of learning, networking, and idea generation.These recognitions have been earned as a result of not neglecting their own education and development as a whole. 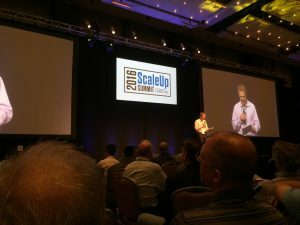 This past spring the Growth Summit focused on Verne Harnish’s book Scaling Up- Mastering the Rockefeller Habits. A book designed to scale a “hyper-growth” business. The book and the seminar have a very specific focus; it’s written with so-called “gazelles” in mind; ambitious, small, entrepreneurial firms that make the transition to hyper-growth companies. Those are companies where a month, or a quarter is more like a year for a regular business. When you’re growing that fast you need some guiding principles, or rules to run by. Verne Harnish created the “Rockefeller Habits” based on the leadership and management principles used by John D. Rockefeller, founder of Standard Oil. (Often regarded as the richest person in history). It’s safe to say that whatever stage of business you’re at, this book is packed with practical things you can implement in this moment to make a noticeable difference to the performance of your company. 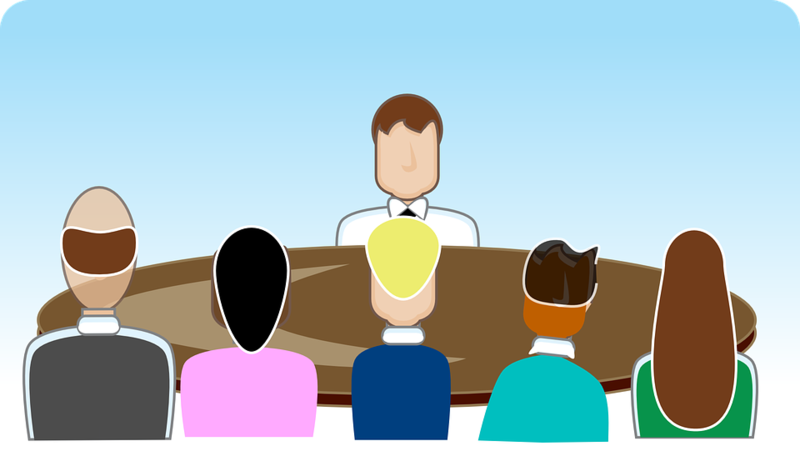 Priority: Does the company have their Top 5 objective priorities for the year and quarter, and a clear Top 1 priority? Does everyone in the company have his or her own priorities aligned with these? Priorities matter because you’ll make faster progress by focusing everyone’s energies on one area. Data: Does the company have sufficient feedback on a daily and weekly basis to ensure the company is running and the market is demanding? This will also help you predict the near-future. Rhythm: Does the company have an effective pattern of well-organized daily, weekly, monthly, quarterly, and annual meetings to maintain alignment and drive accountability? The book goes into depth on how to make sure you’re doing these three things right, as well as touching on company culture and how to recruit effectively. What about this fall’s Growth Summit? It will focus on the idea and implementation of acquired contacts, deal flow, and knowledge as being the fundamental key sources of business development. Gazelles International will bring together experts in leadership, strategy, marketing, sales, operations, and finance to create a best-in-class interactive educational experience. This gives #businessowners the opportunity to become the leader they’ve always imagined they could be–while surpassing all competition. This gives business owners the opportunity to become the leader they’ve always imagined they could be–while surpassing all competition. This Summit will teach the ideas and tools of connecting with people that will propel any enterprise to the next level. It has never been more important for #leaders of growth companies to make the right decisions about people, strategy, execution, and cash. It has never been more important for leaders of growth companies to make the right decisions about people, strategy, execution, and cash. ABG Capital will continue their education in the days to come at the fall Growth Summit in order to continue cultivating their growth in all facets. Keep checking in for our follow up post as we uncover what we have learned and improved on, all stemming from the lessons learned at the Growth Summit! At some point in everyone’s career, they will have a supervisor who gives them direction and expects them to be followed with no deviation. In most organizations today, this can be considered an “old school” way of overseeing an organization or department. This way of thinking has been replaced by models of leadership. Being a leader, rather than a “by the book” supervisor is incredibly important in any size organization, but especially in a small organization. So how do you ensure you have leadership in a small business? Small organizations, such as ours (which has around 55 employees), need to use resources wisely. 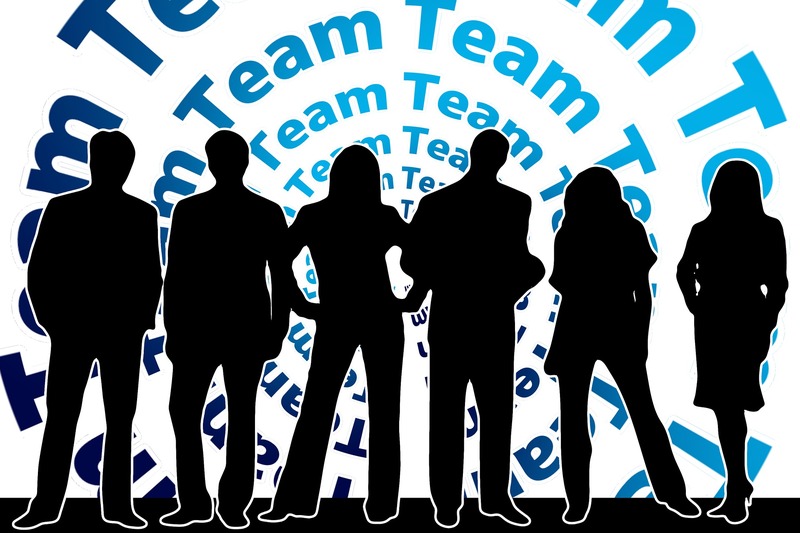 By leading your team, rather than telling them what to do, you are able to give everyone a voice which leads to ideas and invention; rather than just “getting the job done.” Leadership also inspires future leaders and helps with organizational succession planning. The following, from General Patton’s book on Leadership, will help you understand the basics of good leadership. At ABG Capital, we try to inspire current and future leaders through innovative leadership training. We’ll leave you with a few more Patton quotes to take with you and keep in mind while you’re leading at the office. Do you have any favorite quotes or mantras that help you as you lead your team?